Victorian-style homes, a few sprawling rooming houses, and tiny summer cottages give glimpses of days gone by. Newly constructed townhouses and condominiums with unobstructed views of the Bay reside peacefully with their neighbors of a different era. Some of Betterton's residences have experienced extensive restoration and renovation while other dwellings have been left to decline. Scattered among the residences are a town park (boasting tennis courts, playing field, picnic pavilion and playground), a fire hall, a town office, a town maintenance building, a water tower, sewage treatment plant, a U.S. Post Office, one church, and a restaurant. Adjacent to the town on the south side is an American Legion Post. Although there are no operating stores within the town limits, a small grocery/general store is located 3 miles south in Still Pond. Most shopping is done in Chestertown, approximately 12 miles to the south. Major commercial areas also are easily accessible: Annapolis, Maryland, and Dover, Delaware, are an hour away; Baltimore, Maryland, Washington, D.C.; and Philadelphia, Pennsylvania, can be reached in one and one-half hours. Two major airports, Philadelphia and Baltimore-Washington International, are within easy driving distance. The main roads, Ericsson Avenue and Main Street, parallel one another and lead from the southern entrance of Betterton to the northern boundary, the public beach owned by Kent County. This beach is Betterton’s Number One asset and attraction. 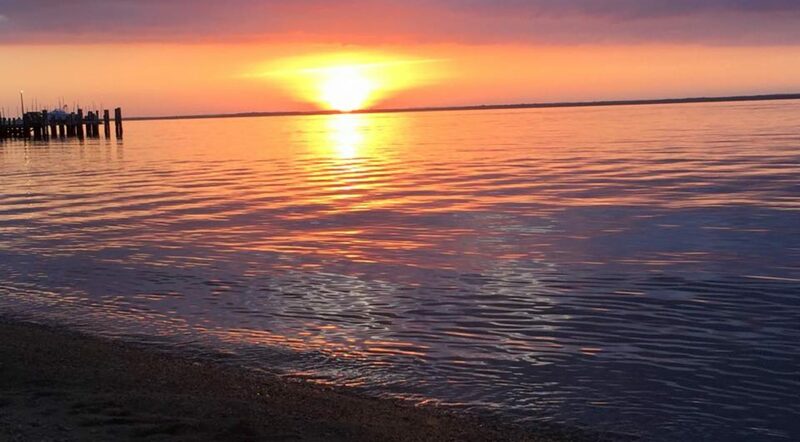 Whether lying on the beach, fishing from the pier, or watching the sunset in the silence, one can easily imagine the charm of yesteryear before being abruptly brought back to the present by a passing ocean cargo ship or the “booms” from the Army’s Aberdeen Proving Ground, directly across the Bay. The recorded history of Betterton dates back to the Seventeenth century. The Fishall Patent was granted in 1664, later becoming known as Fish Hall. The house located at 104 Ericsson Avenue contains foundation bricks dating back to 1698. In 1715 Edward Crew leased Fish Hall and the name was changed to Crews Landing. For the next 100 years Crews Landing was a small fishing village and then later a port for the waterborne transport of local farm produce to urban markets. In 1851, Richard Townsend Turner (a Quaker) named the town “Betterton” after the family of his wife Elizabeth Betterton. The Turner pier, and later the Ericsson pier, provided access to the town for the shipping trade. Eventually townspeople rented out rooms to the travelers, salesmen, and shippers attracted to the beach. Mr. Turner built the Rigbie Hotel (demolished in August 1986) and Mr. Crownhart built the Belmont Hotel (destroyed by fire in 1956). These were joined by such lodging establishments as the Betterton, the Chesapeake, the Country Cousin, the Southern, and many others. Boat traffic from Baltimore and Philadelphia on the Ericsson Line (and others) brought the visitors and vacationers. The Ericsson line was named after John Ericsson, the inventor of the "screw propeller". It was this invention that allowed steamboats to be built with narrow enough beam to allow them to traverse the recently opened Chesapeake and Delaware Canal then only 25 feet wide. Betterton was an easy and natural stop for boats using the canal and the explosion in steamboat traffic brought growth and prosperity to Betterton. For some time before the turn of the Twentieth century, there were 11 scheduled steamboat landings daily at Betterton's piers. 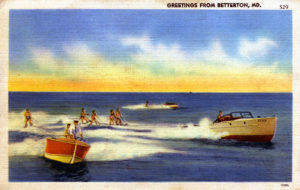 The boom period for Betterton is generally thought to be from 1918 to 1930, when restaurants, taverns, dance halls, bowling alleys, and amusement arcades all helped create the town's resort image. The Great Depression severely reduced the influx of vacationers and during World War II fuel was not available to run unessential excursion steamboats. Indeed, many of the boats themselves were recruited for the war effort and were lost. After World War II, Betterton entered a period of slow decline. People were using their newly available cars more. 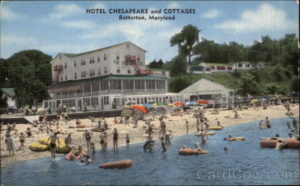 After completion of the Chesapeake Bay Bridge between Kent Island and the western shore in 1954, people in Baltimore found the ocean beaches, with their more modern facilities, to be just as easy to reach as Betterton had been by steamboat. The excursion steamboat service out of Baltimore to Betterton ended after the 1961 season. Betterton lodging establishments were not "modern" by post-war standards and the decline in patrons made renovation and modernization a poor investment strategy. Further deterioration of the buildings caused further decline in the tourist trade in a self-reinforcing cycle, until the few remaining commercial properties at the beach became literal derelicts. At the urging of the Town fathers and using State of Maryland “Open Space" monies, Kent County purchased the beachfront properties in 1978; over the next few years the county razed the derelict structures, opened up and cleared the beach, rebuilt the current boardwalk, bathhouse, and picnic pavilion, thus creating the park and beach area we have today. An influx of "automobile people” from Philadelphia, Washington, and as far away as New York, were attracted by the changes and they bought many Betterton homes as retirement or second homes, investing substantially in their properties. 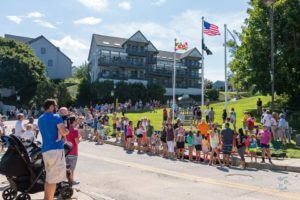 The result is a well-maintained community with a good mix of young and old, permanent residents and weekenders, basically a middle class community. Because Betterton’s historic properties are unique it is important to preserve them as a part of our history and heritage. Special consideration shall be taken to preserve the natural setting and ambiance of Betterton’s historical structures and properties from any adverse effects of development. In recognition of the Town’s architectural, cultural and historic importance, in June 1984, the Betterton Historic District was listed on the National Register of Historical Places by the United States Department of Interior. Bounded on the north by the Sassafras and south by Sixth Avenue and Howell Point Road, the Betterton Historic District consists of about 300 acres of the town center, containing almost all the built area at the date of the listing. As is well known, the National Register of Historical Places is a national listing of buildings, sites and towns which are considered worthy of preservation because of their architectural merits or importance in local, regional or national history. A National Register of Historical Places designation may assist property owners in several ways, including consideration in the planning for federal or federally assisted projects, such as a state highway, eligibility for federal tax benefits and qualification for federal assistance in historic preservation. But such designation does not prevent property owners from making changes in or painting their houses. It also does not limit the use of buildings, cost the property owner anything to be listed, affect tax assessments or make the owners purchase or erect plaques.